Saint Ignatius of Laconi, the son of pious peasants at Laconi, Sicily, was born in 1701. 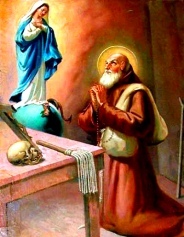 As a young man he vowed, during a serious illness, that if he recovered his health, he would consecrate his life to God in the Capuchin Order. He regained his health, but kept putting off the fulfillment of his vow from day to day. Then, as if to warn him, his life was gain threatened when a horse he was riding became shy. Ignatius called upon St Francis renewing the vow he had previously made, and again received help. This time even his parents raised no objections. Saint Ignatius of Laconi asked for admission at the convent at Cagliari, but the superiors hesitated at first because of his delicate health. Then Ignatius looked up an influential friend who interceded for him, and he was received. The ardor of his soul made him so strong that he could attend all the exercises of the community and even excel his brethren in perfect observance of the rule. After being employed in the community for several years at various occupations, he was appointed quester of alms because of his edifying conduct. The citizens of Cagliari soon realized that Brother Ignatius really gave them more than he took away with him. His modest demeanor was a quiet sermon for all who saw him going about. He seldom spoke; but when charity and the salvation of souls required it, he spoke with exceptional kindness. He would also instruct the children and the uneducated, comfort the sick, and urge sinners to be converted and to do penance. Mockery and contempt he accepted calmly, replying only with kind words. St Ignatius punctually obeyed his superiors, even when it required the denial of his own will. As an example, the good brother was accustomed to pass by the house of a usurer, because he feared that in accepting any alms from him he would share the guilt of this man's injustices. When the man complained and the superior commanded the brother to accept alms from him, Ignatius always called on the usurer for his donation. Perhaps this is what caused the man's conversion. The sister of the servant of God had often written to him asking him to pay her a visit, so she could get his advice in certain important matters. Ignatius had no mind to heed her request, but when his superior ordered him to do so, he at once undertook the journey. But he left again as soon as he had given the required advice. When his brother was sent to prison, it was hoped that, in view of the reputation of Brother Ignatius, the latter could obtain his brother's release. His superior sent him to speak to the governor, but he asked merely that his brother be dealt with according to justice. Not for anything in the world would Brother Ignatius have kept anyone from doing his duty. Despite his infirmity, Ignatius persevered in his arduous work until he was 80 years old. Even after he became blind, he continued to make his daily rounds for two years. The veneration of the people increased, and many sick persons were miraculously aided by him. St Ignatius died on May 11, 1781, and many miracles occurred at his grave. Brother Ignatius was beatified in 1940, and canonized in 1951.